Some people are guilty of babying their children. I’m the opposite. When I say Molly is exceptionally well-behaved and mature for an *almost* three and a half year old, I’m not saying it because she’s my kid or because I like to brag. Heck, in the same breath I’ll be the first to admit that Liam is a real handful (a sweetheart who will win your heart and then promptly trample it in a fit of wailing and screaming during a textbook terrible twos tantrum). In other words, Molly’s extraordinary self-possession is not a testament to my exemplary parenting skills, but is rather just a “hit” in the ol’ parenting lottery that we all play when we have children. Some kids are naturally easier than others. In that regard, we’ve been abundantly blessed. So imagine my surprise when our little angel child started acting out at dance class on Saturday. From day one of class 12 months ago, Molly marched in and owned that classroom with barely a backward glance in my direction. (I’ll pretend I didn’t look around the room with a smug smile, trying not to look too pleased with myself in front of parents whose children were crying as though they were being led into a pit of hungry lions rather than into a dance studio). She was so brave and outgoing that I could not fathom why, as a year veteran and the oldest child in the group, she suddenly dissolved into a pile of tears this past Saturday two minutes after the class started. Trying to speak to her calmly and rationally changed nothing. She didn’t want to dance; she needed mommy to hold her. No amount of bribing with candy or threatening to skip the other fun events we had planned for the day would change her mind. I was completely mystified. Her dance teacher, a grandmother many times over who is adept with crying children (probably one of the reasons she’s brave enough to offer a dance class for 2 and 3 year olds), suggested that maybe she was having trouble adjusting to the new baby. I nodded so that the conversation would end but inside I still disagreed. I figured she must have seen something that scared her (one girl was wearing aggressive blue eyeshadow for a Halloween parade later… maybe that? ), or perhaps she woke up too early, or maybe she was just overstimulated thinking about our busy day ahead… it just couldn’t be the baby. Right? First of all… heart eyes emoji, right? And second, it took all of my restraint not to humble-brag post the whole thing on social media. But I didn’t have time because, remember, blow dryer and mascara. I knew even with Molly’s help I only had five minutes to finish, tops. But that’s my point! She loves her sister. She’s happy; she’s adjusted. Right? The dance class incident got me thinking about the past couple weeks. Molly has been unnaturally clingy. Like at Madeline’s baptism, where I was running around like a chicken without a head like I do anytime I host a party. Fun-loving, party-loving, relative-loving Molly had a total meltdown and refused to be comforted by anyone besides me… which seriously never happens. Every time I rushed out of the room to refill coffee or cut up fruit or hide from the guests in the bathroom, she’d run along behind in a panic as though I were fleeing the building forever. At the time I attributed it to the same factors — being overtired, overstimulated, or some combination of those. At a trunk or treat event at her school the same night as the failed dance class, she once again stuck by my side like glue. It was dark and crowded but we were there with ten people we knew and there was no reason for her to act that way. One instance may have been a fluke and two a coincidence, but with distinct events in our recent past I think it’s time to admit what this is: a pattern. And actually, she’s been clingy other times too. She seems unnaturally frightened of me leaving her places, even though I’ve never left her anywhere and now that I work from home, I am literally with her 24/7 most days. Maybe that’s part of the problem? I was getting ready this morning and once again Madeline was crying in her Rock n Play (it’s a lot like Groundhog Day around here, the weather may change but our routines do not). Remembering the sweetness and, let’s be honest, the convenience of Molly’s help the day before, I asked her if she would rock Maddy for a couple minutes while Mommy finished getting ready. At the time I was annoyed because despite my dear husband’s suggestion, I cannot simply ignore the baby crying. Her little cry makes me stressed out and rush through whatever I’m doing, as it’s biologically conditioned to do. But then I thought about it logically for a minute. My daughter is not even three and a half years old. Why in the world was I expecting her to stop playing and soothe a screaming newborn? I think part of it stems from my own stereotypical first child experience. When you are the oldest and especially when you are naturally mature and extra especially when you are female, adults naturally place more responsibility on your shoulders than you probably deserve. Right or wrong, sexist or not, that’s just the way it is. When I was ten I was scheduling my own dentist appointments. When I was twelve I was solely in charge of my two younger siblings when my parents were at work. At the time I resented the responsibilities but in retrospect, I’ve come to appreciate them for shaping me into the adult I am today. Yes, it’s partly just my nature to be trustworthy, but I also think that having adults trust me that much gave me self-confidence I wouldn’t have otherwise. And as a technical millennial, I’m happy to be a functioning member of society, not one of those stereotypical overgrown children who can’t make it out of their parents’ basements. I don’t remember the exact age that people started treating me like a mini adult. It was probably older than three, but who knows. I do know that I’ve been guilty of expecting that from my little firstborn. How can I begrudge her little tantrums when I have my own mini meltdowns on a daily basis? How can I hold her to some ridiculous “perfect child” standard when in the same breath I concede there’s no such thing as the perfect mom? I was so busy worrying about how Liam would accept the new baby that I forgot to consider Molly might need to adjust to her too. 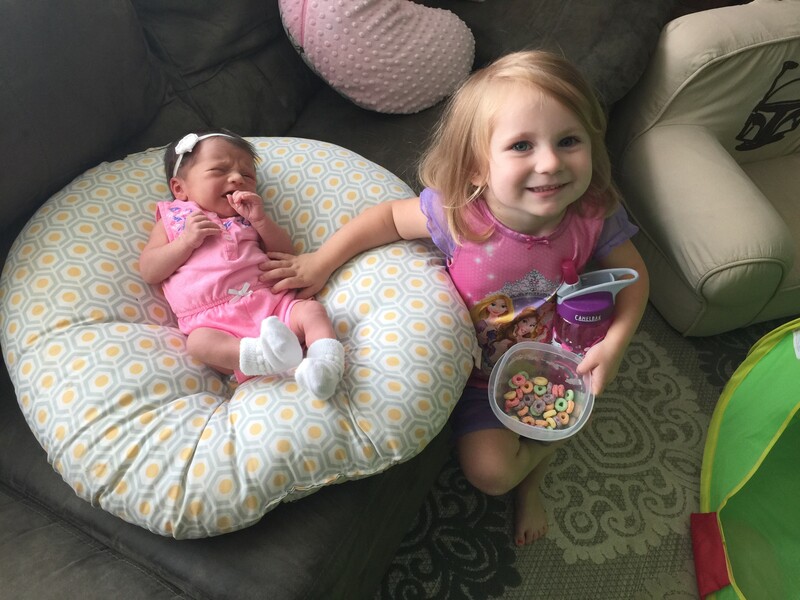 Maybe she is having a hard time sharing her mom, just as I’m having a harder time juggling the three of them than I’d like to admit. I really need to remind myself that she’s still just a little girl, even if she doesn’t always act that way.